Can you guess who the latest addition to the guest line-up of Koffee With Karan 6 is? Well, it is none other than Karan Johar's protege Sidharth Malhotra and actor Aditya Roy Kapur. 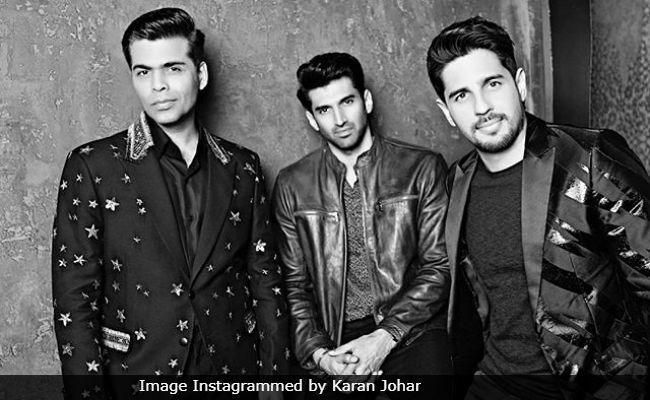 On Saturday, KJo shared a picture of the duo, from the sets of his popular talk show Koffee With Karan 6 on his Instagram profile and accompanied the picture with a caption that read: "A handsome cup of Koffee never hurt anyone! The boys had a blast!" Though the duo have never shared screen space but it will be interesting to see both the actors share the couch on Karan Johar's show. The sixth season of Karan Johar's popular talk show went on air last month and so far, three episodes have premiered. The first episode was all about "girl power" as it featured Deepika Padukone and Alia Bhatt, who spilled the beans about their wedding plans, their equation with each other and more. The second episode of Koffee With Karan 6 was "wild and wacky" as Ranveer Singh and Akshay Kumar shared the couch on the show. The episode can be described as fun-filled. The duo touched upon Ranveer and Deepika's upcoming wedding. Aamir Khan was the third guest to appear on the show and the actor was seen voicing his opinion on the #MeToo movement. The actor also opened up about his equation with his ex-wife Reena Dutta and more. @_aamirkhan in the koffee house!!!!! #koffeewithkaran @starworldindia @hotstar !! Some crazy banter and I played the raps fire with him!!! @malaikaarorakhanofficial was the master and the judge of that round!!! In the sixth season of Koffee With Karan, viewers will get to see many new guests on the show, which includes Janhvi Kapoor and Sara Ali Khan, singer Diljit Dosanjh, rapper Badshah, actors Vicky Kaushal and Ayusmann Khurrana. In the coming episode, Katrina Kaif and Varun Dhawan will make an appearance together.